The CentOS 6.7's default Python is 2.6, it's recommend to install Python2.7. In this configuration，I use Vundle as plugins manager. Vundle will auto manage the .vim directory，all plugins which has benn configured will be download to ~/.vim/bundle/ by default, please keep the .vim directory clean before use it. When Vundle install plugins will trigger git clone opration，the search opration need curl . In this configuration，I use NERDTree as file browser. The NERDTree allows you to explore your filesystem and to open files and directory. It also allows you to hide files or set bookmarks etc. In NERDTree window input ? can get the opration guide. This configuration filters out .pyc, .git, .hg, .svn etc. When you save files, it will check syntax automatically, and display syntax errors. 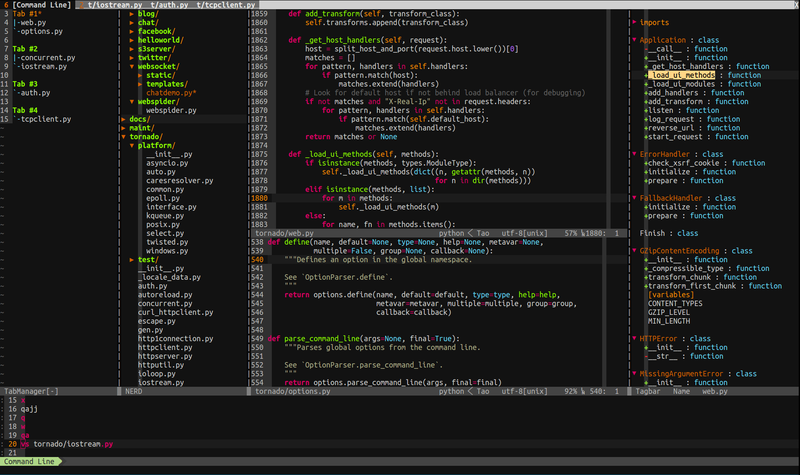 Vim is maintained by tao12345666333. This page was generated by GitHub Pages using the Cayman theme by Jason Long.